Art Quilt Campus a Wonderful Memory By Now! 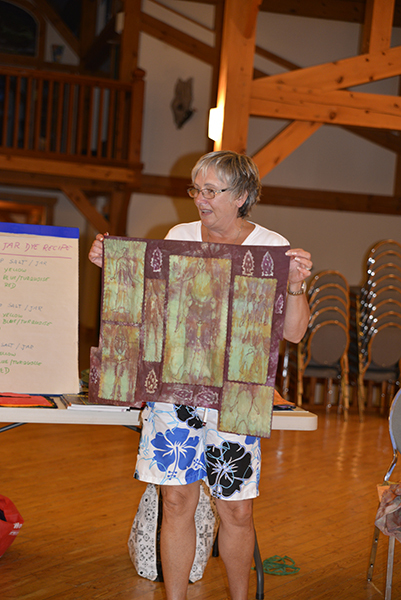 August 11th through 16th marked a busy week for me and 12 amazing art quilters from Saskatchewan, BC, Alberta, Ontario and Colorado. Rather than creating a wordy report I selected a few images to share the fist day with you today. 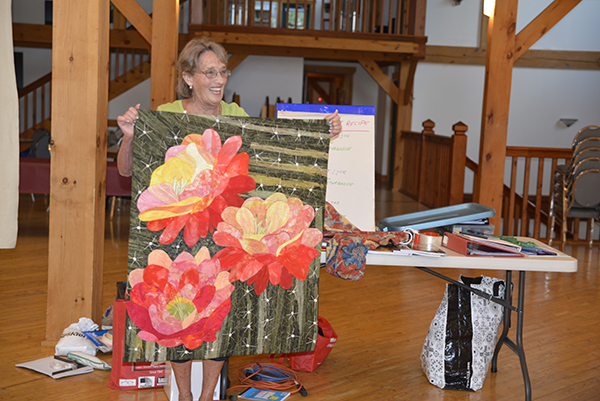 Stay tuned for more about Art Quilt Camp in Wednesday’s post. Enjoy meeting the group! Initial introductions took place on Sunday night after our first wholesome dinner and workstation set up. 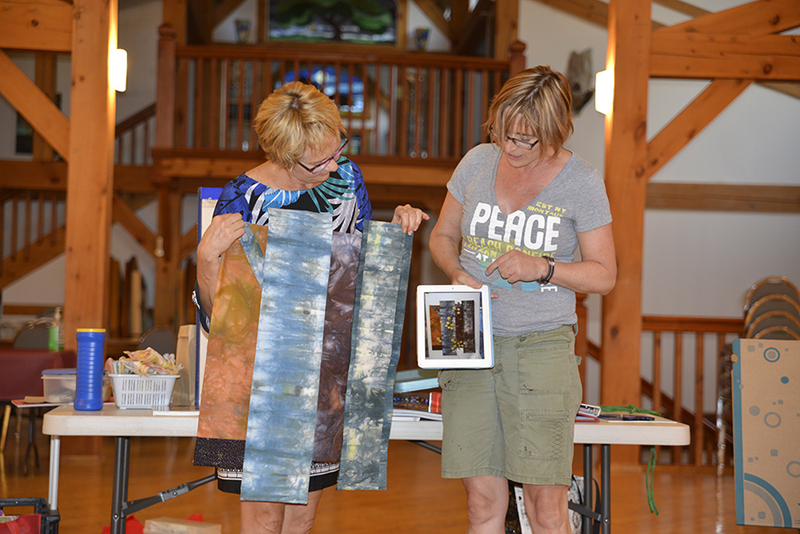 Cheryl is sharing her experience in marbling with Denise. The first tray for marbling is almost ready! 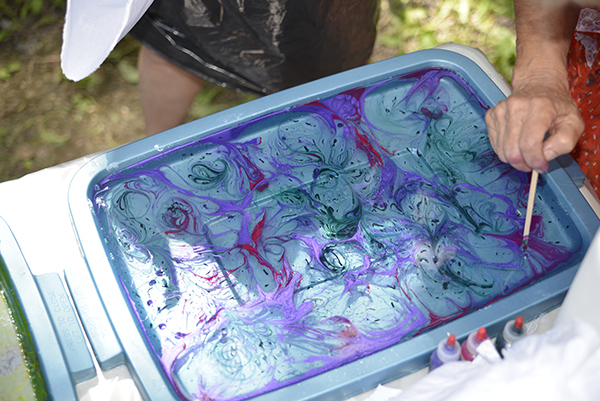 It takes more than one set of hands when marbling fabrics. 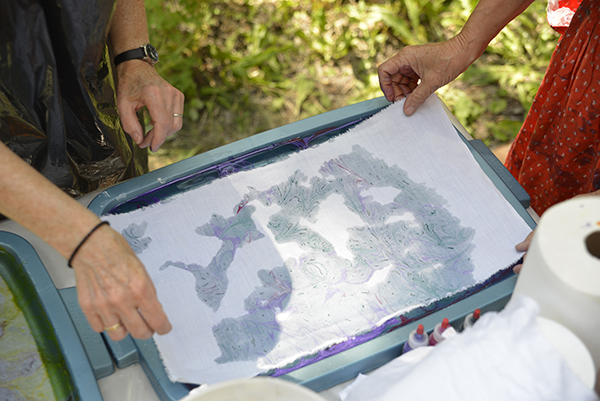 Placing the prepared fabric over the marbling medium and paint. 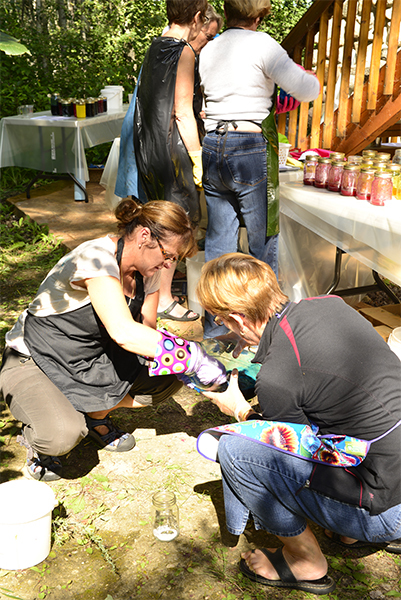 Patti and Cathy collaborating to measure dye for the gradation dye exercise. 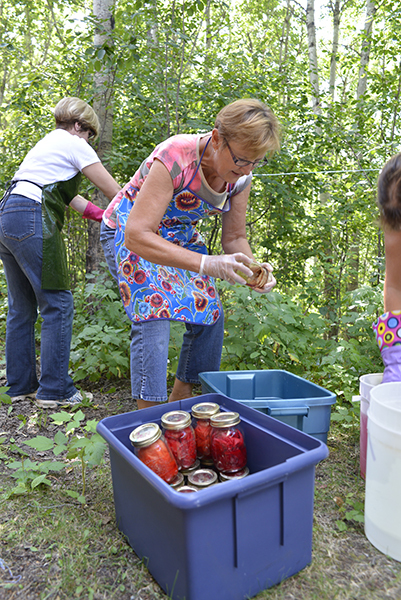 Ready to rinse the first batch of gradation dyed fat quarters. 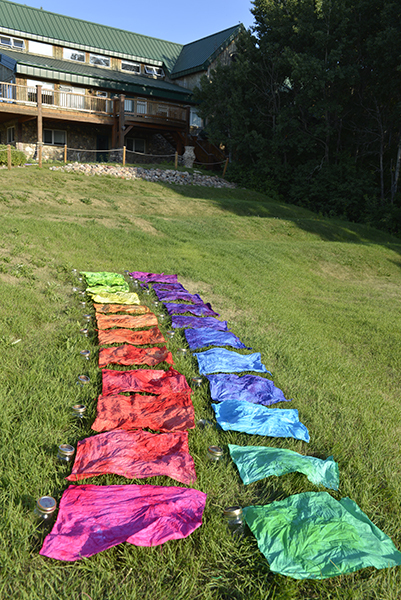 Fabrics rinsed and drying – the first 24 step color wheel is ready for sharing. Monday afternoon brought some well deserved time inside, away from the hot sun and mosquitoes (good thing we had all packed Watkins insect repellent!). Everyone engaged in a design exercise dealing with various possibilities for composition. 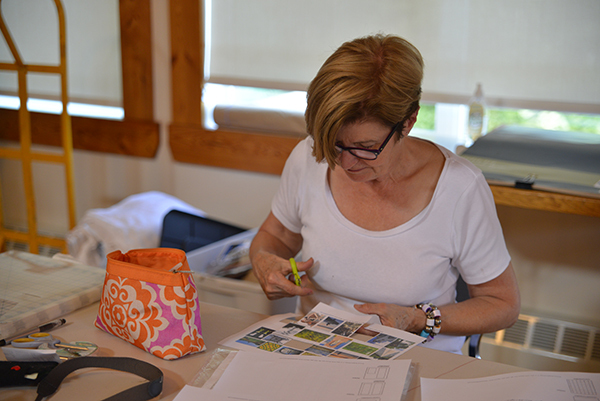 Gillian is examining, selecting and placing the images to describe a particular composition. Monday night brought Show and Tell, a way to introduce ourselves using some of the work we produce. 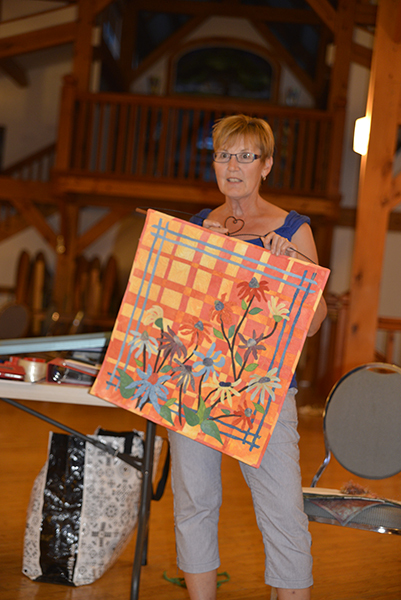 Shirley brought along an array of new work to share during Show and Tell on Monday night after dinner. 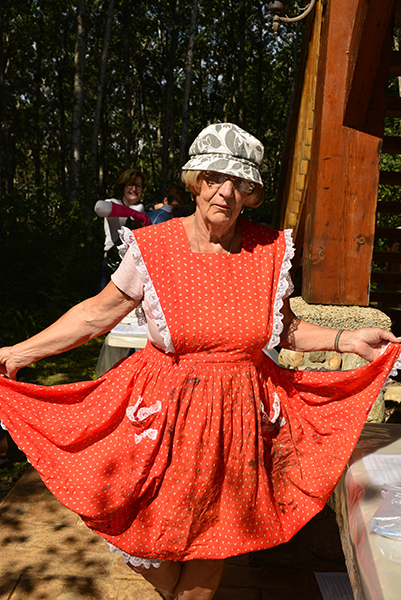 Paula participated at Emma Lake in 2012 and has continued to work on her own over the past twelve months. 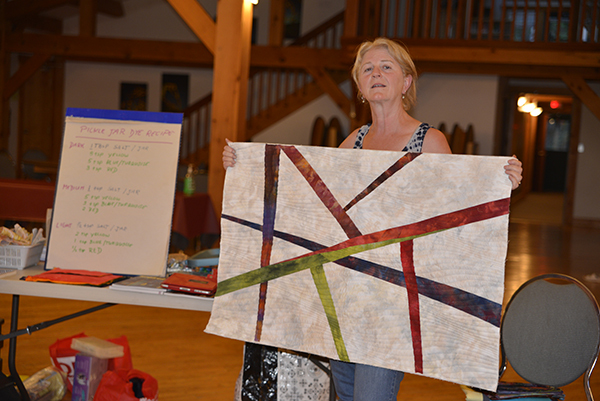 “My Way” is one of the works she shared from her journey along the road of art quilting in solitude. Leona shared her latest landscape triptych, a richly colored piece that evokes strong emotion. 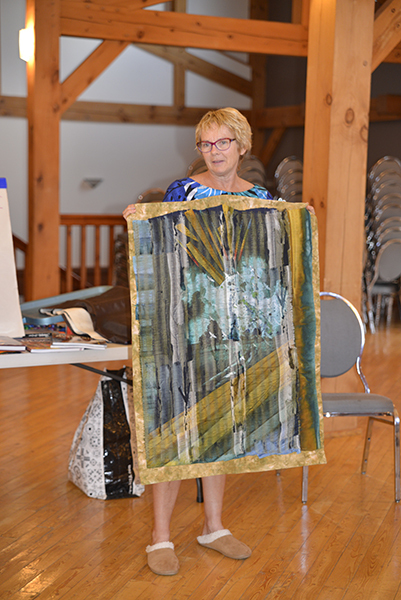 Donna brought along her piece from 2012 at Emma Lake, a piece that was accepted into a banner competition in Fernie, BC earlier this year. 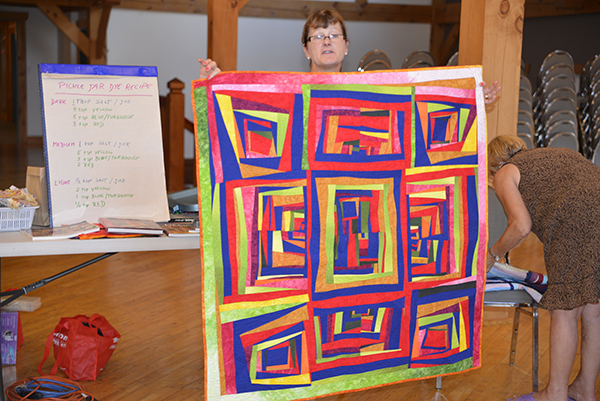 Cathy has recently arrived in the art quilt world. She brought along some colorful creations to introduce herself. 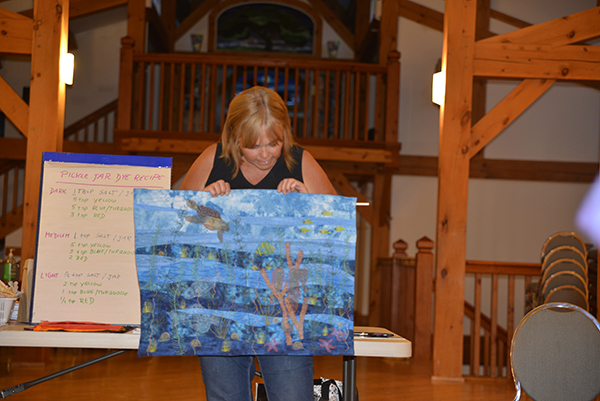 Bev shared one of four pieces started at Emma Lake in 2012. Alison (right) is sharing “Last Summer at Emma Lake”, a piece she began in 2012 at Kenderdine Campus, Emma Lake in my last summer workshop. Cheryl came all the way from Colorado to join us. 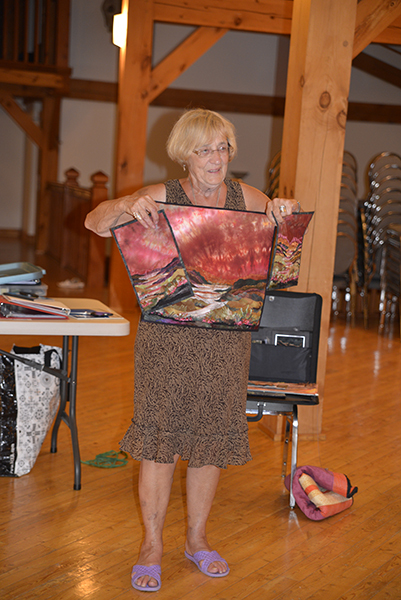 She is an accomplished art quilter. Denise is getting ready for a two person exhibition later this year. She shared a variety of pieces that are close to completion. 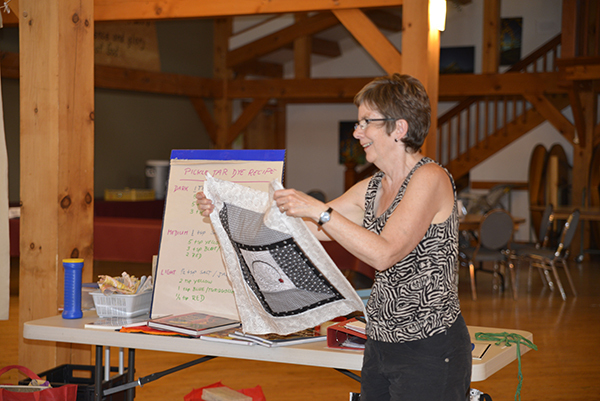 Patti is an art quilter from Alberta who teaches and exhibits regularly. Her strong sense of color cheered up everyone. 26 Aug	This entry was published on August 26, 2013 at 6:31 am. 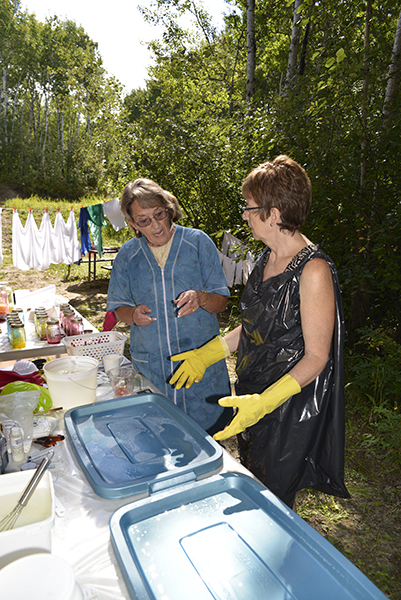 It’s filed under Art, Creativity Update, In the News, Journaling, Special event, Studio / Workshop / Creative Space Challenge and tagged Art Quilt Campus 2013, fun in Saskatchewan's wilderness, great minds thik alike and don't mind fighting off a few mosquitoes, meet the particpants, Shekinah Retreat Centre. Bookmark the permalink. Follow any comments here with the RSS feed for this post. It was indeed a wonderful retreat. 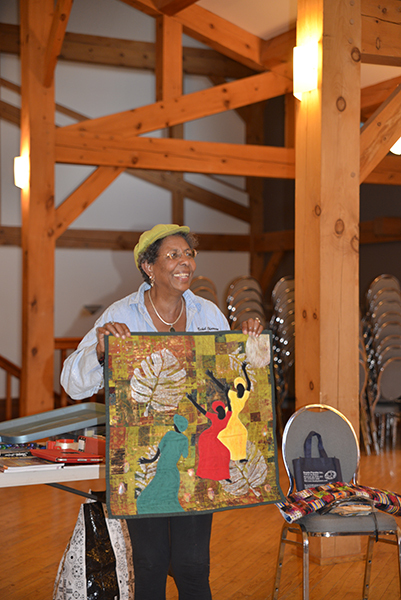 Two of the highlights for me were meeting the other art quilters who are all so diverse in their approaches and the knowledge Anna so graciously shared with us. I am so looking forward to next year!!! Great to see you plan to attend next year, Shirley. I am working on details and will incorporate improvements as suggested in the feedback I received. Beautiful photo’s. It was a very exciting week to be around so many creative people. I feel like I’m moving forward in my art. It was great to see everyone from last year and to meet all the new people from this year. Truly a wonderful experience. Glad to hear it, Donna! It was great to have you take part again this year. What a delight it would have been for you, Anna, to be with people with such lively imaginations and dedication to fine-tuning their already considerable skills. 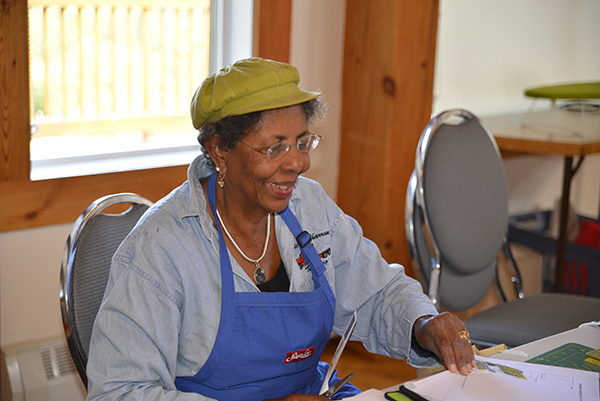 It was a wonderful time to work with everyone and witness their creativity, Linda! It was a wonderful retreat! I love being fully immersed in creating, but now the finishing!!!! 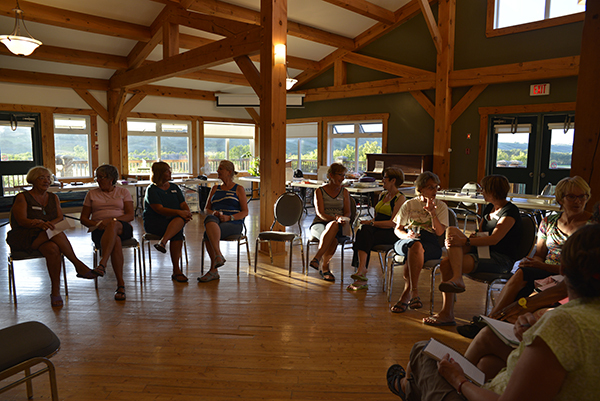 That’s another story….I enjoyed meeting everyone new and revisiting with lasts years girls. I plan to join in next year….until then……happy stitching! Paula, it was a pleasure to have you part of this exhilarating week. Thanks for coming and participating in the Masterclass. Looking forward to next year!